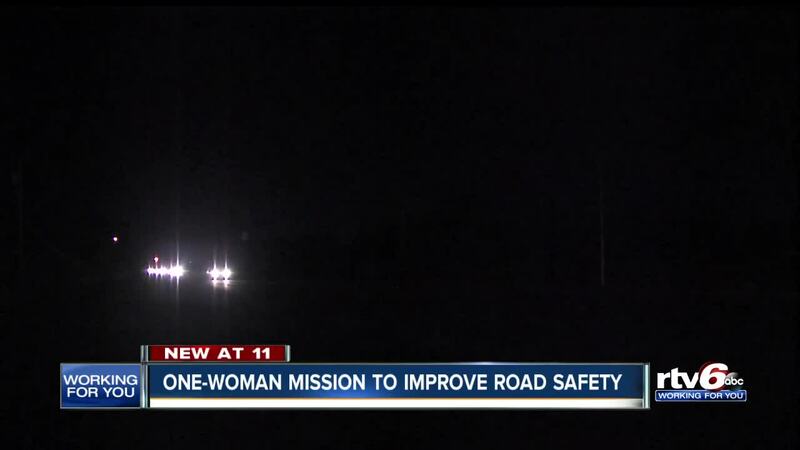 After a pedestrian was killed crossing the road an Anderson woman is working to improve safety. ANDERSON, Ind. — After a deadly crash killed one woman and seriously hurt another on a dark Anderson street last week, one woman is trying to get more light and a crosswalk in the area, to make sure it never happens again. Cynthia Young knows the two women who were hit Nov. 1 on State Road 9, near E. Cross Street at about 7:45 p.m.
Police say two people were crossing the four-lane road when they were hit by a truck. Nancy Shaw, 50, of Anderson was pronounced dead at the scene. Melissa Spradlin, 29, Anderson was taken to the hospital in serious condition. Police say the driver of the truck did stop and is cooperating with the investigation. The driver told police he did not see the two walk in front of him. Young wants the state to light up the dark section of State Road 9 (also known as Scatterfield Road), so it's safe for residents of the nearby Cross Lakes Apartments to get to the shopping center across the street. She also wants a crosswalk in the area. "I'm speaking for everybody," Young said. "I'm speaking for people who have to cross this walk and it's a dangerous walk." Young is also trying to get a caution light installed to sync with traffic signals at nearby intersections, so speeding drivers know to slow down along the stretch of State Road 9. When she turned to the city to get answers, she was given paperwork for a petition. She has 58 signatures so far. "This is my first time doing this," she said. "I really don't know what to do or how to do it, but I'm walking out here on faith and what I do know."